The Fates were believed to control each person’s destiny. Clotho, the spinner, spins the thread of a person's life; Lachesis, the apportioner, decides how much time is allowed, and Atropos, the inevitable, cuts the thread to bring death. 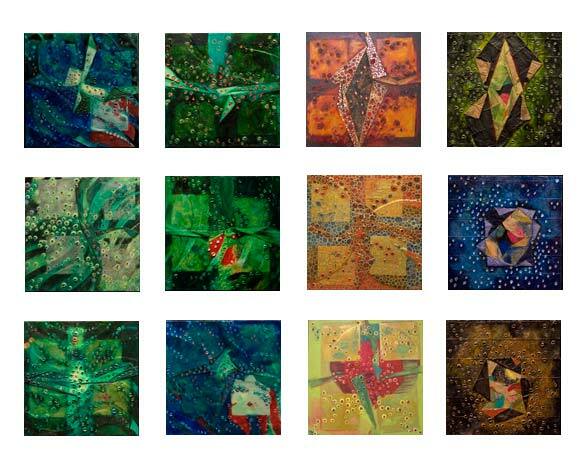 This is a cycle of thirty-seven nine-inch-square paintings (one for each of my 37 years) and prose that chronicle a journey of color, texture, and longing. Each panel is the result of intense, nearly obsessive, work, with numerous progressively more translucent layers applied in the following order: cut and collaged oilstick drawings, variously folded ghost money (four pieces), acrylic medium worked with a palette knife, several layers of oil paint, and a final layer of gold- or silver-leaf pen work. A couple pieces are even more involved. Working small was electrifying. Paintings whose edges are close whisper, “Come hither; I have a wonderful secret.” As I veered toward "maximalism," a small surface area made me comfortable, allowed me to stay focused without fretting about "filling all that space." Holding each panel in my hand as it took shape, alternately joyful and tormented until, blissfully, I witnessed the moment it delivered itself, was a blessing and a (re)birth. Links to individual images are coming soon.